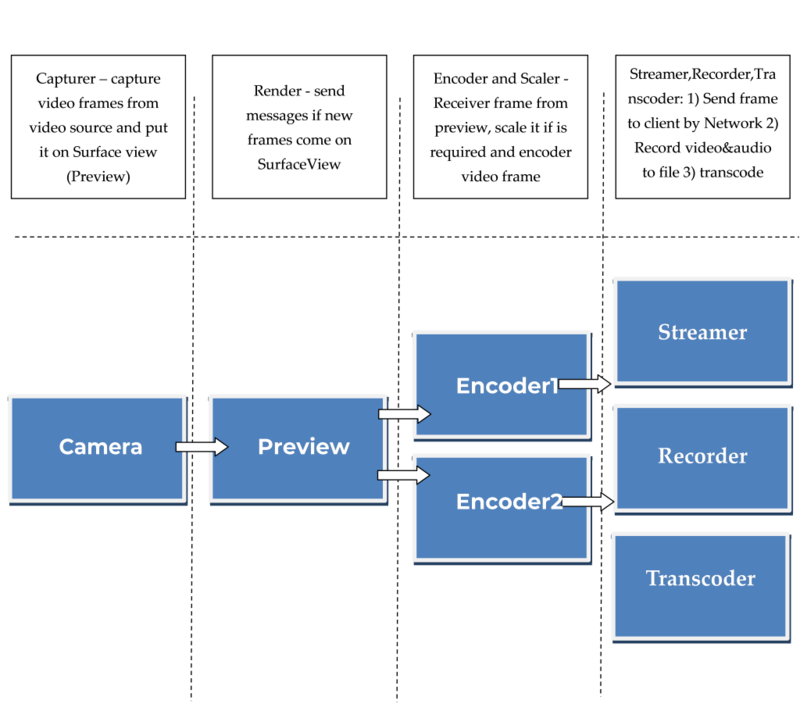 The VXG Encoder SDK is a set of tools for fast and convenient development of mobile applications for capturing video, audio and streaming online using Publish RTMP, RTSP protocols. The core of the SDK is a library for application development. Multi-channel support – simultaneous encoding of 2 streams: Main and Secondary channels. Video integration with any Activity – is based on SurfaceView and can be integrated into any Activity. Low latency for network streams – a special API to control encoder latency. Record streams – a special API to record streams into an mp4 file. Transcoding – obtain the raw video or elementary streams video or/and audio. RTSP server – completely functional RTSP server, RTP by UDP, TCP. Encrypted channel – RTSP server transfers data via an HTTPS tunnel. Streaming from files – streaming from files by RTP. Network bandwidth test – client can check bandwidth using a nRTSP/RTP channel. This is not required for evaluation and testing. It is only required after purchasing a license in order to remove the evaluation version limitations. Step 2: Create an empty file called license in your application folder assets and paste your license key into this file. See the picture below how it should look in corresponded test application \streamland_streamer. The following settings should be set in manifest to avoid any issues with camera using and the SDK. The SDK notifies about results, errors and notifications using the “MediaCapture” callback. All messages are synchronous and the SDK core waits until the application handles a message. Following functions are members of the MediaCapture class. Open the camera, create a preview and initialize all modules. Upon successful completion Open() returns 0. Otherwise -1 is returned. All errors are provided in the callback status. Connect to the network resource or open a local media file, create a pipeline, allocate resources and start video playback. Enable encrypted channel RTP by HTTPS. It works if set StreamType= STREAM_TYPE_RTSP_SERVER. Enabled – enable encrypted channel SSL in HTTP tunnel. sslCertPEM – ssl certificate in pem format. RsaPrivateKey - RSA private key. No value is returned by function SetSecureStreaming. Enable encrypted channel RTP by HTTPS. The URL for the tunneled stream is rtsp://TX_IP:8080/ch0 . Close the capturer and release all resources. No value is returned by function Remarks Closes capturer, destroys the pipeline, releases all resources that were allocated on the Open() call. Start all modules (streaming, recording and transcoding) according to the configuration. Start all modules (streaming, recording and transcoding) according to the configuration. Important note: Start function should be called after CAP_SURFACE_CREATED notification. Start streaming module. Format of streaming is set configuration. Important note: Start function should be called after CAP_SURFACE_CREATED notification. Start the recording module. Important note: Start function should be called after CAP_SURFACE_CREATED notification. Stop only the recording module. Start only the transcoding module. Start transcoding module. Important note: Start function should be called after CAP_SURFACE_CREATED notification. Provides the current state of capturer. Returns status of the Recording module. Returns the time from that is expired from starting of capturer. Upon successful completion, getDurarion() returns time in milliseconds from capturer start. Otherwise, -1 is returned. All errors are provided in callback status. Return time from that is expired from starting of capturer. Provide the number of video frames in buffer before streaming. Upon successful completion, getVideoPackets() returns number of frames. Otherwise, -1 is returned. All errors are provided in the callback status. Provide the number of video frames in buffer before streaming. It is used for streaming only, mode: Publish RTMP. Provide the number of audio frames in buffer before streaming. Upon successful completion, getAudioPackets() returns number of frames. Otherwise, -1 is returned. All errors are provided in callback status. Provide the number of audio frames in buffer before streaming. It is used for streaming only, mode: Publish RTMP. Provide the timestamp for the last video frame. It is sent by streaming module by network. Upon successful completion, getLastVideoPTS () returns a timestamp. Otherwise, -1 is returned. All errors are provided in the callback status. Provides the timestamp for the last video frame. It is sent by streaming module by network. It is used for only the streaming module in case the mode is Publish RTMP. Provides the timestamp for last audio sample. It is sent by streaming module by network. Upon successful completion, getLastVideoPTS () returns a timestamp. Otherwise, -1 is returned. All errors are provided in callback status. Provide the timestamp for last audio sample is sent by streaming module by network. It is used for only streaming module in case if mode is Publish RTMP. Provide the number or reconnections to RTMP server that happened from the streaming start. Upon successful completion, getStatReconnectCount returns number of reconnection. Otherwise, -1 is returned. All errors are provided in the callback status. Provide the number or reconnections to RTMP server that happened from streaming start. It is used for only streaming module in case if mode is Publish RTMP.